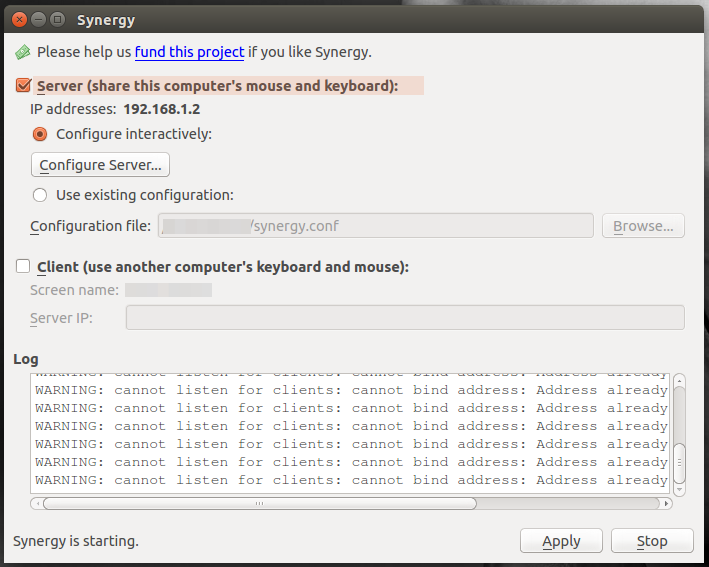 Synergy is a cross-platform and open source tool for sharing one mouse and keyboard between multiple computers seamlessly. Though the real use of this technology must be for enterprise users, individual users can have a lot of fun with this powerful tool as well. Get past the donate page and you'll notice that DEB and RPM packages for Linux are available. If you're on Ubuntu, download the 32/64-bit version according to your requirements. 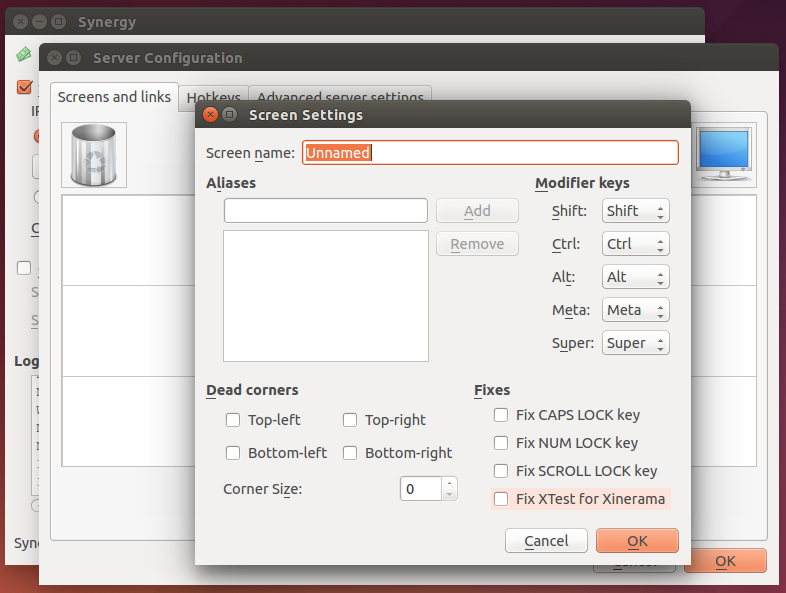 Either double-click to install it OR do the following in Terminal (while in Ubuntu). Point to the correct Synergy file (consider the above Synergy file name as indicative only) and you're done. Synergy 1.5 is up and ready to go. 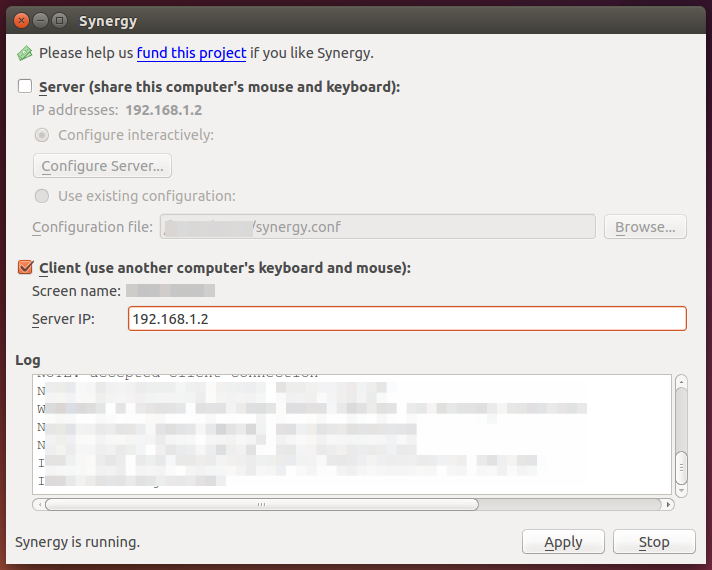 How to use Synergy in Ubuntu 14.04 LTS? Launch Synergy software from the primary computer (the one which you want to use as the server whose keyboard and mouse will be the ones in use). Hit the Configure Server button (Server option will be selected by default). Drag the screen to which ever "square" you want (moving depending on the physical location of the actual monitor/client will be ideal). Double click on it to edit Settings. Enter the Screen name (which you'll get by launching the Synergy app in your client computer). Done. Now, launch Synergy on your client computer. Now, simply try moving your mouse from one monitor to the other. I tried Synergy in two of my laptops running Ubuntu 14.04 LTS (one 32 bit and another 64 bit) and the experience can be best described as "magical". How about you?